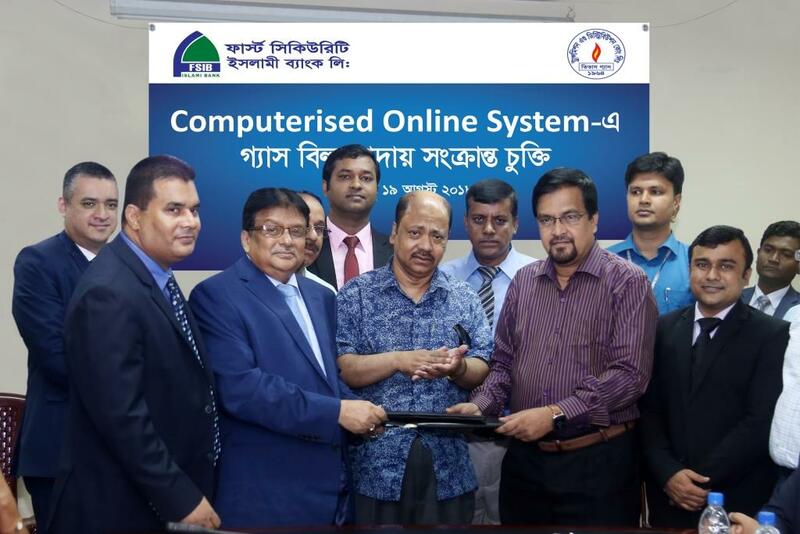 On 19 August, 2018 Titas Gas Transmission & Distribution Company Limited (TGTDCL) & First Security Islami Bank Limited (FSIBL) signed an agreement for computerized online system gas bill collection. Customers of Titas Gas Transmission & Distribution Company Limited can pay bills through any branches of FSIBL. On the presence of Engineer Mir Mashiur Rahman, Managing Director, Mr. Mahmudur Rab, General Manager-Administration Division and Company Secretary (Additional Charge), Titas Gas Transmission & Distribution Company Limited & Mr. Abdul Aziz, Additional Managing Director, FSIBL signed the agreement from their respective organizations. Among others, high officials of Titas Gas Transmission & Distribution Company Limited and Mr. A.K. Mohammad Jawadul Haque, Head of Marketing & Business Development Division and Mr. M. M. Mostafizur Rahman, Manager, Karwan Bazar Branch were present on the occasion.